Thanks for helping us stay engaged. I appreciate your motives of wanting to help all of us be better photographers. I have found myself using burst mode more than I did with film also. I especially like it when taking "candid portraits" of my kids - using burst mode will almost always get me one shot with them "posed" the way I want and without any closed eyes, head turns, etc. To answer Kevin's question about flash and burst mode, I find myself turning the flash off more and more for daylight portraits (candids in particular) so I can rip off a series of shots in burst mode. I'll then go back to fill flash as my default. But I love the spontaneous nature of burst mode candids, and with the ability to use higher ISOs, I'm needing the flash less than before. As for Tony's comment... Amen brother! Using burst mode for portraits is great advice. I tried this for a few impromptu ones at a party recently, and I could always find an image where everyone's eyes were open, their expressions looked good, etc. 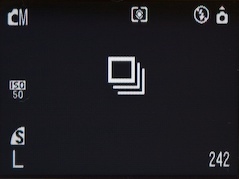 But I am having one problem with the auto stack feature in Aperture: if you reject an image in a stack, it doesn't immediately disappear from the project like when you reject an image not in a stack. It also doesn't show up in the built-in rejects folder for easy deletion. You need to create a custom smart album that picks up rejects and ignores stack picks. I must have missed something in the documentation, because this clumsy approach can't be correct.